Vintage cars towing vintage campers. We were very intrigued and wished we could have looked at them a bit closer. 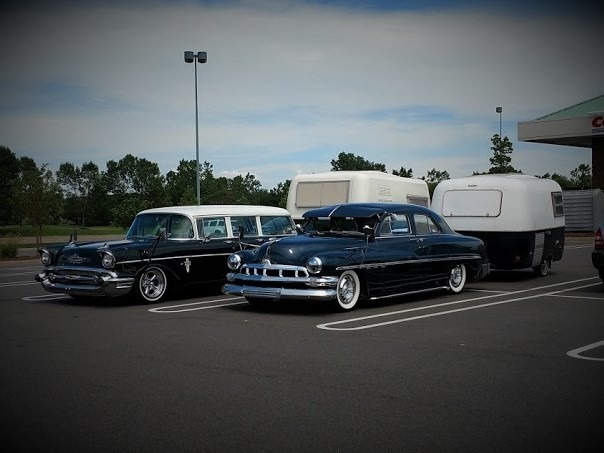 The station wagon on the left is a old Chevrolet and we ‘think’ the one on the right is a Cadillac. The owners must have been in Costco, we didn’t get to speak with them. Wish I could have seen inside the campers too. And speaking of campers, as you know, we are currently living in ours while our house is being built. 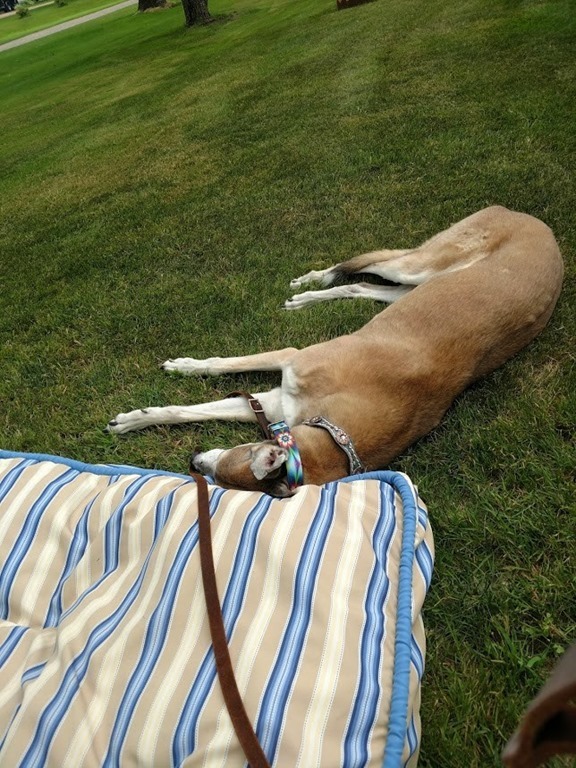 You can see our Retired Racing Greyhound, Mandy, lounging outside…on her ‘outside’ bed. We are sitting at the fire ring enjoying a fire in the evening. Mandy also often joins us around the fire. 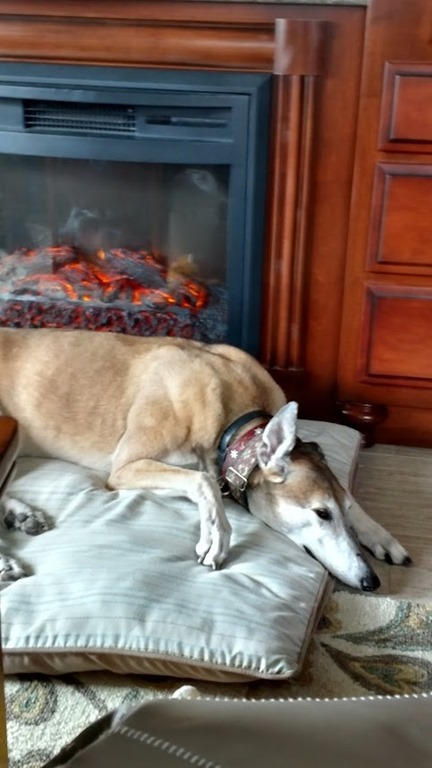 SOOOO we do bring her nice bed out next to our chairs to lay on when ever we sit around the fire now because she seems to want to be with us, but as you can see, chooses ‘her’ way to lay on it. To her it is more like a large pillow. 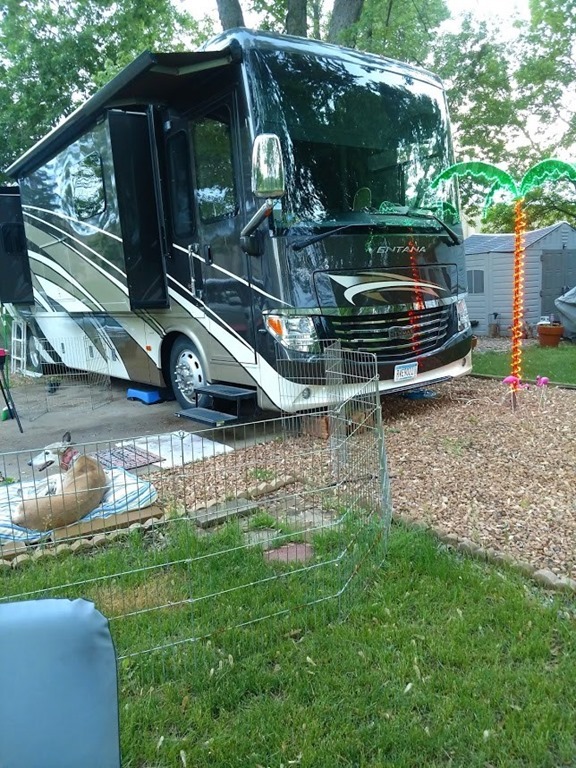 Our camper is pretty large and has slides going out from the left and the right side to make our living room pretty spacious.. However, a lot of the inside belongs to Mandy. She has three beds and, when we aren’t using it, the couch is hers as well. 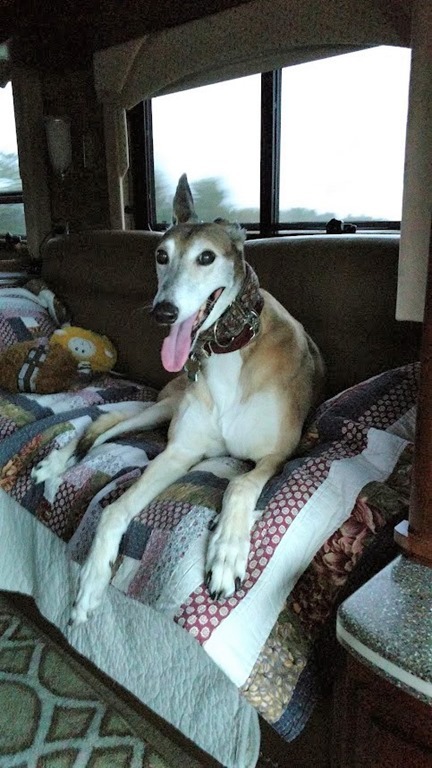 She generally won’t get up on the couch while we are present in the camper unless we are in bed sleeping. 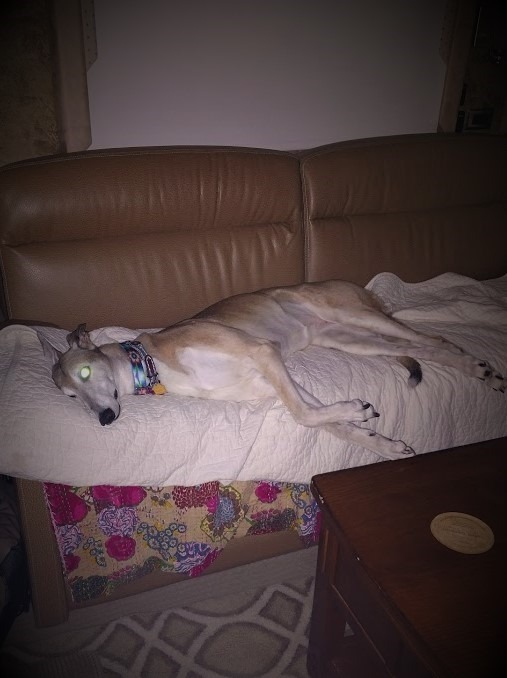 These are rules she has imposed on herself, as we have never really made her stay off the couch in the camper. Here is a photo taken of her early in the morning when I came out from the bedroom. There is also a bed for her in at the foot of our bed and right beside the couch where I sit. But she also sprawls out in front of the sink and the fridge. She is pretty comfortable everywhere. 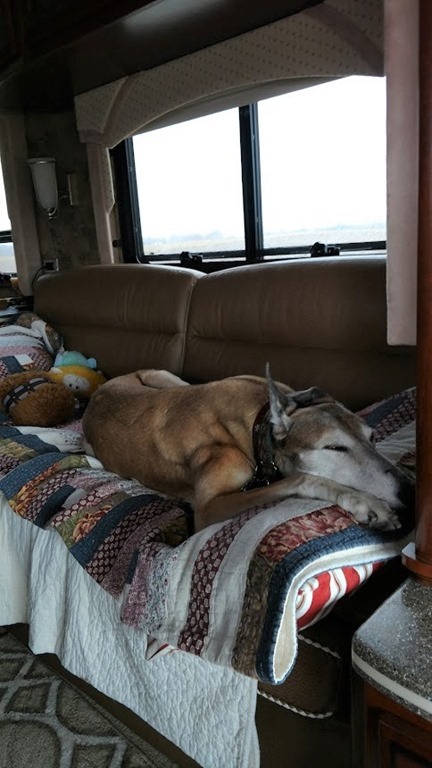 When the RV is in travel mode and we are moving along she also has a variety of places she sleeps. I really like her to lay on the floor, she makes me nervous laying on the couch. And she does mostly stay down on the floor on her bed – or behind her bed. But occasionally decides to ride up on the couch. 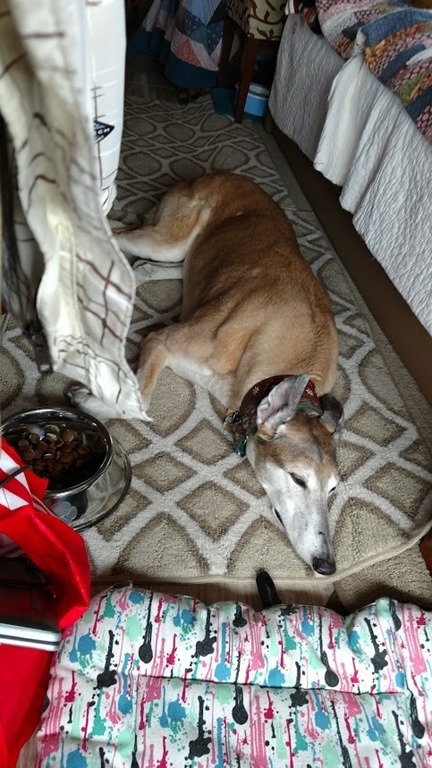 Behind the bed – can’t believe it is more comfortable but whatever makes her happy!